Maya Angelou was born on April 4, 1928. She passed away in 2014 and left a void in the literary world and in the hearts of those she touched with her words and advocacy. Though she was a prolific writer of poetry, she has also published seven autobiographies as well as writing several plays, television shows and even cookbooks. She also danced professionally, sang and performed her own compositions both on Broadway and on a calypso album she released early in her career. She both performed in and wrote several plays. 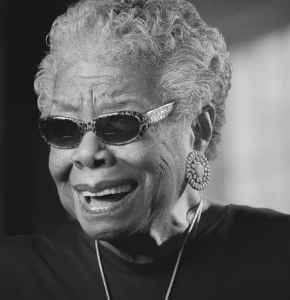 Angelou also had a very successful acting career and has lived a brave life filled with turmoil, devastation, redemption and survival. She worked closely with Martin Luther King, Jr. during the Civil Rights Movement. "Angelou was honored by universities, literary organizations, government agencies, and special interest groups. Her honors included a Pulitzer Prize nomination for her book of poetry, Just Give Me a Cool Drink of Water 'fore I Diiie, a Tony Award nomination for her role in the 1973 play Look Away, and three Grammys for her spoken word albums. She served on two presidential committees, and was awarded the Spingarn Medal in 1994, the National Medal of Arts in 2000,and the Presidential Medal of Freedom in 2011. Angelou was awarded over fifty honorary degrees." According to Wikipedia, "Her volume Just Give Me a Cool Drink of Water 'fore I Diiie (1971) was nominated for the Pulitzer Prize, and she was chosen by US President Bill Clinton to recite her poem On the Pulse of Morning during his inauguration in 1993." Maya Angelou, the People's Poet, we will never forget how you made us feel through your extensive and varied works. Truly, a phenomenal woman! Be sure to explore this amazing life through her works at the St.Tammany Parish Library.